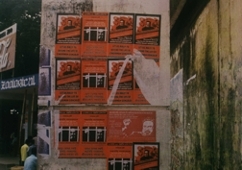 Within a campaign that started on the 19th of September, various activities were carried out in the areas where the latinos are concentrated, and in the center of Madrid with the distribution of MPP leaflets as well as materials about the people's war in Peru. 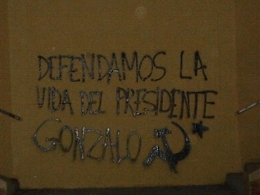 On the Day of Action in defense of Chairman Gonzalo, Andalucian Maoists carried out paintings in Andalucia Posters in central Malaga promoting a lecture and video viewing in defense of Chairman Gonzalo and the People's War in Peru. 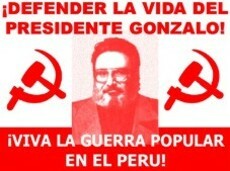 In Germany lectures were held, paintings were made, and thousands of leaflets were distributed calling to defend the life of Chairman Gonzalo. 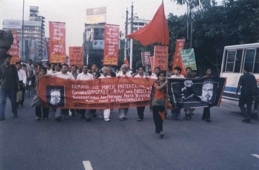 In Bangladesh, different organisations brought out posters on the occasion. 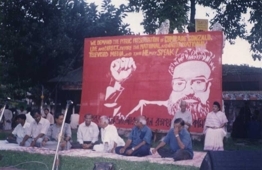 The Solidarity Committee to Defend the Life of Comrade Gonzalo (SCDLCG) organized a protest meeting and rally on 24September 2004 and also another meeting, cultural performances, photo exhibition and documentary film show on 1 October 2004 at the Dhaka University Campus at a read island close to the Teachers & Students Center, Dhaka University. In both the meetings some eminent persons renowned journalists, popular and a communist leaders were present. The MPP-MCP, Italy document of September2004 was translated and was read out on 1 October 2004 at the road-island meeting organized by (SCDLCG). Moreover statements were issued on the 24 September 2004. 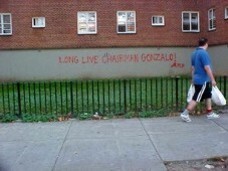 In New York City, actions were carried out. Particularly in the area Queens, that has a large Peruvian population; the Jackson Heights and Elmhurst Areas were filled with small posters in Spanish. Some days before, paintings were made in the area of Woodside Housing Projects. In Italy, there were actions in 5 cities. In Milan a large painting was made with the 3 slogans of the event, 9 meters wide, 1 meter tall, in front of the Peruvian consulate. 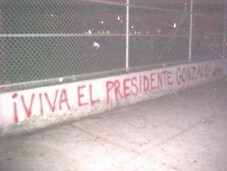 This had great impact among the Peruvians that were standing in line for their papers. In another action in Milan a banner was put up at a big party organized by the Peruvian community. 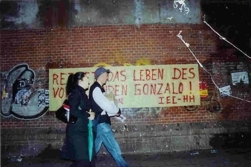 Other banners were put up in Palermo, in 2 places, one with the slogan of defending the life of Chairman Gonzalo, close to a lodging center for immigrants and another large banner with slogans in support of the people’s war. In Taranto the banner was put on a moving bridge that unites two parts of the city, a key point of circulation, in front of a command local of OTAN of the Italian navy. 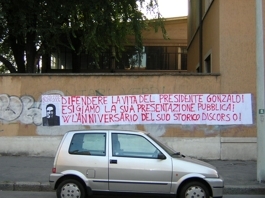 The banners were « Defend the life of Chairman Gonzalo, the greatest Marxist-Leninist-Maoist today, Great Leader of the PCP and guide of the People’s War against Yankee-imperialism » In Ravenna a banner was put up with slogans of the international day, and many posters with Chairman Gonzalo, made by youths of the anti-fascist movement. In Milan, Genoa, Palermo and Taranto meetings were held in the evening of the 24th and during the 2 following days, with the masses, in solidarity with the people’s war, where the video of the Speech was viewed. 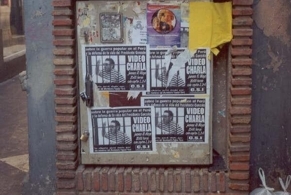 In France, thousands of leaflets were distributed in the principal subway stations and different public centra. 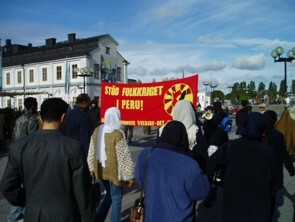 In Sweden, the Friendship Association Sweden-the New Peru (VfSNP) made manifestations in the cities of Stockholm, Helsingborg, Lund, Malmö, Södertälje and Uppsala. 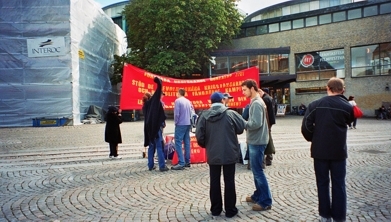 20.000 VfSNP leaflets were distributed. 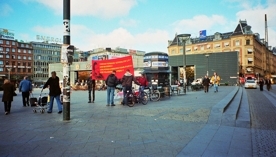 In Denmark, the Friendship Association Denmark - the People's Republic of Peru under Formation (VDPF) carried out distribution of leaflets and literature in Copenhagen.